Congratulations! You’ve survived the apocalypse! Now what’s next? Lucky for you, your fellow survivors put together a guide to ease your adjustment into post-apocalyptic life; ARMAGEDDON: A NIGHT OF LAUGHS AND PLEASANT SONGS! 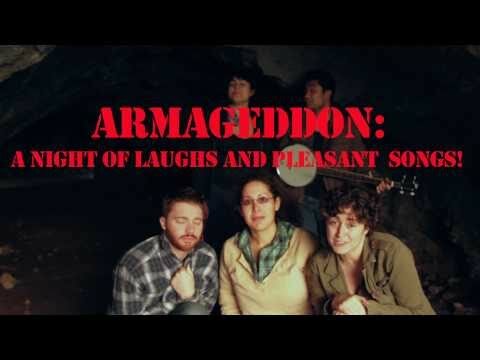 ARMAGEDDON: A NIGHT OF LAUGHS AND PLEASANT SONGS sprung from the sy-fy obsessed minds of three, Los Angeles based writers. Seeking to create an interactive audience experience, ARMAGEDDON combines live music and sketch comedy to explore the important themes of love, life and zombie decapitation. Featuring the cool stylings of musical duo Rachel Garcia and Thu Tran, the talented Apocalypse Players, and the world’s only non-vaporized ventriloquist! Jump in your abandoned tank and come on down to Theatre Row in Hollywood, California, your one-stop destination for live performance! The show will be @ THE COMPLEX, Friday June 24th, Saturday June 25th and Sunday June 26th, 10:00PM in Hollywood California. Become a Fan of APOCALYPSE PLAYERS by liking us on FACEBOOK!